Award-Winning Christian Kids Space Adventure Story! New FREE video game app for Android, iPhone, and iPad! Raegan and RJ's Space Adventure - the ultimate Christian kids space adventure - like you've never played it before! 'Raegan and RJ's Space Adventure!' is a video game APP that is FREE to download on the Android, iPhone, iPad, or iPod Touch! In this fun and family friendly arcade came, your goal is to help Raegan and RJ collect valuable space rocks for the Christian Space Program, but watch out for dangerous obstacles - Tap to Jump! Rated E for everyone! The video game app is FREE to download and FREE to play Level 1!! The app has an in-app upgrade of 99 cents which is paid once to unlock levels 2-5 forever! Levels 2-5 add 4 more planets to explore with new backgrounds, increases each game time from about 3 minutes to 15 minutes, and increases the difficulty level because with each new level the character moves faster, which gives less reaction time to avoid the dangerous obstacles! SPECIAL LIMITED TIME INCREDIBLE OFFER!! Anyone who purchases the 'Raegan and RJ's Space Adventure!' in-app upgrade to get levels 2-5 forever for only 99 cents, and e-mails us a copy or screen shot of their Apple or Google Play receipt showing proof of purchase to our e-mail address at reaganandrjinspace@aol.com, will be e-mailed a R&RJiS graphic novel trilogy to have forever in PDF format!!! Tell us in the e-mail whether you want Jhenna Lusong's GN trilogy or DL Maffet's GN trilogy and we will e-mail it right to you! Jhenna's amazing trilogy consists of 'Raegan and RJ Save the Day', 'First To Mars', and 'Celebration at Alpha Centauri', or tell us if you would rather have DL's trilogy which consists of 'Satellite Rescue', 'Solar Storm', and 'Mission to the 3 Suns'! You can see details below about the graphic novels! Don't miss out on this incredible offer!!! Each full color graphic novel is about 26 pages long and contains a separate R&RJiS adventure! GO RAEGAN AND RJ IN SPACE! New 'award winning' 3D animated adventure! 'Raegan and RJ in Space: First to Mars!' professionally animated 3D adventure by Jumping Frog Entertainment, the best animation company in the world! The ultimate Christian Space Adventure - like you've never seen it before!!!!! Take a space journey with Raegan, RJ, and six of their friends to Mars and back! This is the coolest animated Christian kids space adventure ever! Our 3D animated adventure won the BEST ANIMATION awards at the Christian Cinemafest in 2018, the Christian Family Film Festival in 2017, and was also shown at the Faith Film Festival in 2015, the Christian Worldview Film Festival in 2016, the Big Cross Christian Film Festival in 2016, and the HIS Film Festival in 2017 - Go R&RJiS!!!! You can download a free low resolution digital copy of this GN in a pdf at the web page called 'FREE GRAPHIC NOVEL' along the left side tabs! Enjoy!!! Graphic Novel and Animated Adventure Combo! Go to the STORE Tab and you can order a 'First to Mars' GN with the 3D animated adventure DVD in the back! We will mail it to you! Imagine how cool it would be to give this to a young Christian who loves space adventure - an award-winning Christian Space adventure graphic novel with a cartoon in the back! The only one of its kind in the world!!! Go Reagan and RJ in Space! 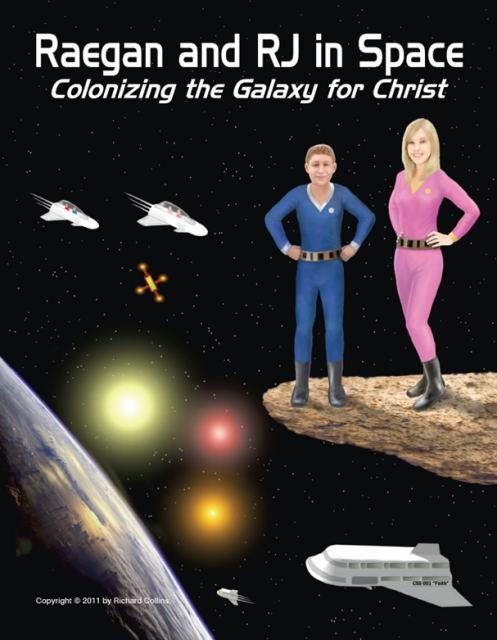 1) 'Raegan and RJ in Space: Colonizing the Galaxy for Christ' - PROFESSIONALLY ILLUSTRATED! This is a 48 page graphic novel set in the year 2025, and tells the story of the first Christians to colonize Alpha Centauri! In this graphic novel we meet all the families, get introduced to Hope Tennessee and the Christian Space Program, see the CSS Faith launch, see Raegan and RJ save the Earth from an incoming asteroid and receive medals for bravery from the President, see all the kids have a race with the emergency escape speeders, see the families establish the colony of 'New Hope', and finally celebrate the first Christmas in a new star system. THIS GRAPHIC NOVEL IS A 2014 READERSFAVORITE.COM BOOK AWARD WINNER! Cover art and illustrations by Mr. Robert Stimpson. 2) 'Raegan y RJ en el Espacio: Colonizando la Galaxia por Cristo!' - PROFESSIONALLY ILLUSTRATED! This is a Spanish version of the graphic novel above. It is 48 pages full color. It contains the original story, but everyone speaks Spanish throughout. It was done so kids in Spanish speaking countries can enjoy the story! It is set in the year 2025, and tells the story of Raegan and RJ and 5 Christian families travelling to the Alpha Centauri Star System to colonize it for Jesus. 'Go Raegan and RJ in Space' - or as we can now say 'Vayan Raegan y RJ en el Espacio!' Covert art and illustrations by Mr. Robert Stimpson. 3) 'Drawing Raegan and RJ in Space: Colonizing the Galaxy for Christ' - PROFESSIONALLY ILLUSTRATED! This is a 25 page graphic novel which shows how Mr Stimpson illustrated the stunning 'masterpiece' above. The full color graphic novel goes through 25 pages of different subjects like the CSS Faith Star Ship, Raegan and RJ, the Emeregency Escape Speeders, the Bridge, and has a little explanation, a beginning sketch, and the final subject the way it appears in the graphic novel. This graphic novel is intended both for fans of R&RJiS, but also for any up and coming illustrators or artists who want to study Mr. Stimpson's techniques. The cover is awesome, and was done to show what the novel is about, with an unfinished R&RJ illustrating the graphic novel! See how the amazing journey to Alpha Centauri was done! Cover art and illustrations by Mr. Robert Stimpson. 4) 'Raegan and RJ in Space: Raegan and RJ Save the Day!’ – PROFESSIONALLY ILLUSTRATED! This is an adventure for very young kids age 4-6 years old. It is full color, 28 pages long, set in 2025, and tells the story of Raegan and RJ on the orbiting moon station with their friends, when they get a distress call from a family from another space program, not as advanced as ours, whose rocket ship, the 'Andromeda', has lost power on the moon. Can Raegan and RJ rescue the family before their air and supplies run out? Find out in 'Raegan and RJ Save the Day!' Cover art and illustrations by Ms. Jennifer Lusong. THIS GRAPHIC NOVEL IS BOTH A 2014 PINNACLE BOOK AWARD WINNER AND A READERSFAVORITE.COM BOOK AWARD WINNER! 55) 'Raegan and RJ in Space: First to Mars' - PROFESSIONALLY ILLUSTRATED! This is an adventure in which Raegan, RJ, Maria, Carlos, Kayla, Demarco, Juan, and Clara, become the first humans to explore Mars. During their visit they deploy a scientific satellite to capture data, emplace a Christian Space Program marker, and deploy a 'Terra-forming' machine which will change Mars and its atmosphere so it can be lived on by humans some day! 'Go Raegan and RJ in Space' - on Mars!!! It is 26 pages full color. Cover art and illustrations by Ms. Jennifer Lusong. THIS GRAPHIC NOVEL IS A 2014 PINNACLE BOOK AWARD WINNER AND A 2015 READERSFAVORITE.COM BOOK AWARD WINNER! 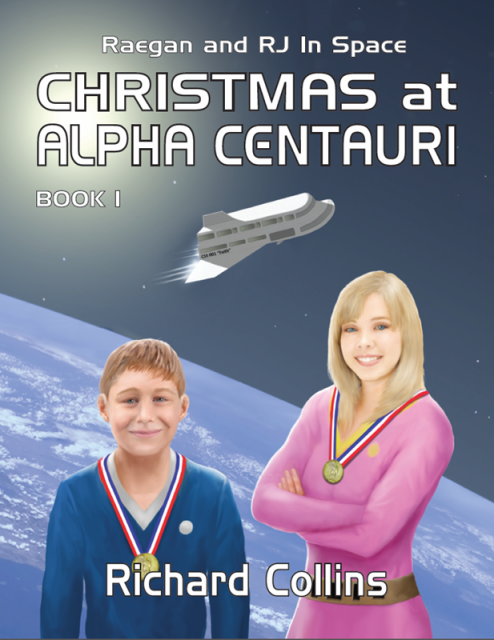 6) 'Raegan and RJ in Space: Celebration at Alpha Centauri' - PROFESSIONALLY ILLUSTRATED! This is a 30 page full color graphic novel which tells the story of Raegan, RJ, and 5 families travelling to Alpha Centauri to be the first colonists on a new world! It is set in the year 2025. Cover art and illustrations by Ms. Jennifer Lusong. THIS GRAPHIC NOVEL IS A 2015 READERSFAVORITE.COM BOOK AWARD FINALIST!THIS GRAPHIC NOVEL IS A 2014 PINNACLE BOOK AWARD WINNER AND A 2015 READERSFAVORITE.COM BOOK AWARD WINNER! 7) 'Raegan and RJ in Space: Satellite Rescue' - PROFESSIONALLY ILLUSTRATED! This is the 'Earth Mini-Adventure'. It is 34 pages full color, is set in September of the year 2024, is 9 months before the 'CSS Faith" and crew leave for Alpha Centauri; it tells the story of Raegan and RJ's first mission in which they are called on to rescue a satellite which has failed in orbit around Earth. Cover art and illustrations by Mr. D.L. Maffett and Mr. Donald Armstrong. 8) 'Raegan and RJ in Space: Solar Storm' - PROFESSIONALLY ILLUSTRATED! This is the 'Sun Mini-Adventure'. It is 30 pages full color, is set in the year 2025, and tells the story of Raegan, RJ, Imogene, and James, where they go on a mission to try and deflect an enormous solar flare after the largest solar storm in history. Can Raegan and RJ and their friends figure out a way to deflect this harmful flare from hitting the Earth? Find out in "Solar Storm"! Cover art by Mr. D.L. Maffett and Mr. Donald Armstrong. THIS GRAPHIC NOVEL IS A 2015 READERSFAVORITE.COM BOOK AWARD FINALIST! 9) 'Raegan and RJ in Space: Mission to the 3 Suns' - PROFESSIONALLY ILLUSTRATED! This is the 'Alpha Centauri Mini-Adventure'. This was the first professionally illustrated graphic novel all the way through! It is 30 pages full color, is set in the year 2026, and tells the story of Raegan, RJ and 4 of their friends undertaking their first mission since arriving at their new colony at Alpha Centauri, in which they attempt to place information gathering satellites at each of Alpha Centauri's 3 suns. Cover art and illustrations by Mr. D.L. Maffett and Mr. Donald Armstrong. THIS GRAPHIC NOVEL IS A 2013 READERSFAVORITE.COM BOOK AWARD WINNER! 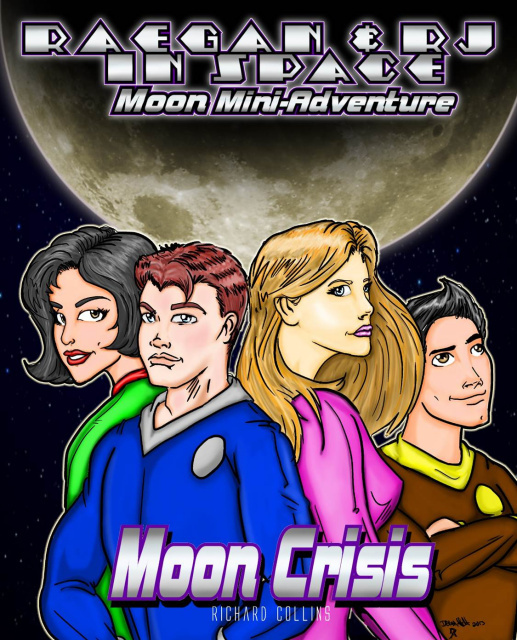 10) 'Raegan and RJ in Space: Moon Crisis'- This is the 'Moon Mini-Adventure'. It is 26 pages full color, is set in the year 2025, and tells the story of Raegan, RJ, Carlos, and Maria, who go on a mission to save the Earth after the Moon's orbit is thrown out of whack by a rogue asteroid hitting the far side of the moon. Join Raegan, RJ, Carlos, and Maria as they race against tiem and the odds to save us! Can they figure out a way of savign the Earth from the incoming Moon and right it's orbit? Find out in 'Moon Crisis!' Cover art by D.L. Maffett and Mr. Donald Armstrong. 12) 'Raegan and RJ in Space: Final Mission' - This is the 'Galactic Mini-Adventure'. It is 26 pages full color, is set in the year 2039, and tells the story of the final mission for Raegan and RJ, where they are grown up and CPTs of the first Christian Super Star Ships 'CSSS 001 Genesis' and 'CSSS 002 Exodus', leaving to colonize the first two systems on the other side of our galaxy. Cover art by Mr. D.L. Maffett and Mr. Donald Armstrong. and RJ in Space: Outbound!' - This is the 'Kruger 60' Mini-adventure. It is 26 pages full color, is set in the year 2028, and tells the story of the 6 families that journeyed to the 'Kruger 60' star system on the 'CSS 007 Mercy' to establish a colony. The three main families in the story are the Sanchez', Maffetts, and the Hunters. Maria and Carlos Sanchez , Imogene and James Maffett, along with Kayla and Demarco Hunter, are the adventurers. This story is unique in the series because Raegan and RJ are not in it, because they are at Barnard's Star in 2028. 'Raegan and RJ in Space: Outbound!' - This is the 'Kruger 60' Mini-adventure. It is 26 pages full color, is set in the year 2028, and tells the story of the 6 families that journeyed to the 'Kruger 60' star system on the 'CSS 007 Mercy' to establish a colony. The three main families in the story are the Sanchez', Maffetts, and the Hunters. Maria and Carlos Sanchez , Imogene and James Maffett, along with Kayla and Demarco Hunter, are the adventurers. This story is unique in the series because Raegan and RJ are not in it, because they are at Barnard's Star in 2028. 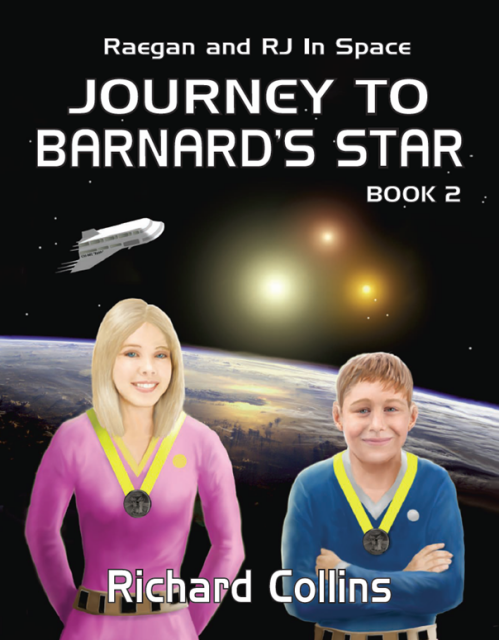 14) 'Raegan and RJ in Space: Journey'Journey to Barnard's Star' - This is the second book in the trilogy. It is 110 pages full color, is set in the year 2027, and tells the story of Raegan and RJ and 5 Christian families traveling to the Barnard's Star System to establish their second colony. Cover art by the world famous book cover artist Mr. Duncan Long. Cover art by Duncan Long. 15) 'Raegan and RJ in Space: 'Homecoming' - This is the third book in the trilogy. It is 140 pages full color, is set in the year 2029, and tells the story of Raegan and RJ and the families returning to Earth for a heroes' welcome. Cover art by the world famous book cover artist Mr. Duncan Long. Please see the 'Film Festival' and the 'Awards & Reviews' page - 'Raegan and RJ in Space: First to Mars' 3D animated adventure won the Best Animation award at the 28 January 2018 Christian CinemaFest, the Best Animation award at the 6 Aug 17 Christian Family Film Festival, was voted by attendees at the Christian Film Festival on 31 Dec 2016 and 26 May 2017 as 'Best for Kids Fan Favorite' Award; was selected to be shown at the 2017 His Film Festival on 21 April 2017, the 2016 Big Cross Christian Film Festival on 10 Nov 16, the 2016 Christian Worldview Film Festival and the 2015 Faith Film Festival, a great honor! 'Raegan and RJ in Space: First to Mars' graphic novel is a 2016 Readersfavorite Book Award Winner! 'Raegan and RJ in Space: First to Mars!' 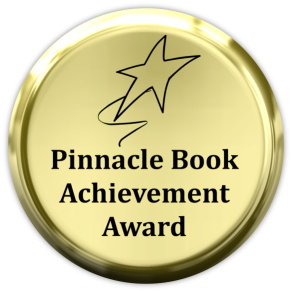 graphic novel is a 2014 Pinnacle Book Award Winner and a 2015 Readersfavorite Book Award Winner! 'Raegan and RJ in Space: Celebration at Alpha Centauri' graphic novel is a 2015 Readersfavorite Book Award Finalist! 'Raegan and RJ in Space: Solar Storm' graphic novel is a 2015 Readersfavorite Book Award Finalist! 'Raegan and RJ in Space: Raegan and RJ Save the Day!' graphic novel is a 2014 Pinnacle Book Award Winner and 2014 Readersfavorite Book Award Finalist and Book Award Winner! 'Raegan and RJ in Space: Colonizing the Galaxy for Christ!' graphic novel is a 2014 Readersfavorite Book Award Finalist and Book Award Winner! 'Raegan and RJ in Space: Mission to the 3 Suns' graphic novel is a 2013 Readersfavorite Book Award Finalist and Book Award Winner! Please see the 'Awards & Reviews' page - 'Raegan and RJ in Space: Celebration at Alpha Centauri! ', 'Raegan and RJ in Space: Solar Storm! ', 'Raegan and RJ in Space: First to Mars! ', 'Raegan and RJ in Space: Reagan and RJ Save the Day', 'Raegan and RJ in Space: Colonizing the Galaxy for Christ! ', and 'Drawing Raegan and RJ in Space!' have all received a 5 out of 5 Stars reviews! If you like 'Raegan and RJ in Space!' and you have a FACEBOOK account, why don't you 'LIKE' us when you visit our FACEBOOK page! Once you LIKE the R&RJiS facebook page you will get alerts when new artwork and graphic novel covers are posted before anyone else. This web site is "PayPal" approved for your security when purchasing any products on this web site.